It is my pleasure to present the discussion I had with one of my favorite photographer/writer, Guy Tal. Ever since I know him he has been very approachable, always willing to help and inspire. He is one of the most eloquent person I know when it comes to the artistic discussions (check out his blog) and yet someone whose images need no explanation other than a mere title. Hello Guy, Thank you for your time. It is my pleasure to have you as a guest on my blog. I always wanted to know how you spent your childhood/adulthood? Were you also art-lover as a kid? Did anything/anyone in particular inspired you to take photography as profession? I actually didn’t think in terms of “art” until much later in life. As a kid I spent much of my time out in the fields and orchards around my house. I remember always being fascinated by natural beauty. I read every guide book I could find, learned the names of every plant and critter I came across and could spend hours just examining and watching little things. As I grew up I started venturing farther and at some point decided to bring a camera along to share some of my findings. Those first few years didn’t yield much in terms of fine art but I loved the way the camera helped me explore and isolate become more aware of visual relationships. Many photographers I know are also Music lovers, themselves play one or the other instrument. What about you? I wish I did. I love listening to music but never took the time to learn to play. The very first question may people ask is which camera/lens do you use. What do you think is the reason for the assumption of creative responsibility transfer? On a more general level, photography as art — as opposed to a documentary medium — is a relatively new concept. It doesn’t yet have the centuries of established notoriety and understanding behind it that other fine arts do. There is still a great need to educate the public about the role of the artist in conceiving and making artful images and in their value as objects in and of themselves, independent of the process that created them. It’s not the tools that make the art (see: this journal entry). And that brings me to the a sub question with a newly coined verb – did you photoshop? I have always loved your intimate landscape photographs. How does one define it? How do you approach when you make them? Great question! I was always attracted to images that capture details and patterns but never really thought of them as “intimate” until I was exposed to the work of Eliot Porter. I wouldn’t necessarily define intimate landscapes in tangible or measurable terms. To me an intimate landscape is one that expresses the photographer’s personal relationship with the subject, rather than a general representation of a scene. Intimate landscapes always have an order imposed by the photographer, frame only those elements that are necessary to draw attention to the specific characteristics and nuances that fascinated him/her, and are very often fleeting moments or arrangements that can never be re-created. These qualities, in my opinion, make intimate landscapes the most personal and expressive form of nature photography. Any number of people can make wonderful, identical images of famous scenes by following simple recipes, but an intimate landscape can usually be associated with one original artist and their own creative vision. Any particular images which have brought extreme emotional response from you? Quite a few. Those are really the ones that make it all worth doing. They are images I can look at and be immediately transported to that exact moment in time and experience it all over again. Unfortunately there are a lot more stories still in my mind that need to be written one of these days. You often hear comments these days: Oh, I have seen a similar photograph. Can you give any tips about how to impart your own vision on a scene when there are many photographers around you? You can almost apply the rules of meditation here – start by clearing your mind of distractions. These may include preconceptions about subject matter, standard compositions, “best” light etc. If you leave your home with the mindset of “I’m going to Yosemite to get a shot of Gates of The Valley at Sunset,” you’re pretty much guaranteed to miss everything along the way until you get that one shot. You’re also guaranteed to be deeply disappointed if that one shot doesn’t materialize as you expected. If you leave the preconceptions behind your mind will be free to see an infinite array of possibilities in every tree, every flower, every creek and lake, patterns in rocks and hillsides… you may find so much you may to keep you occupied you may never even get to your original destination, but more importantly - you’ll be happy and creative and those images will be *yours*. You can always go back to the well-known spots another day. Don’t lock your mind into what you plan to come back with. Just be in the moment every moment and keep watching and you’ll never be disappointed, even if you come home with no images at all. Almost every other person has got access to a decent camera and digital darkroom tools. Technology (tools like google map, internet sources) has turned many spots which were relatively unknown until few years back into semi-icon status. You see tons of similar images posted on websites such as flickr. Where do you think this is taking us to? What will happen to the professional photographers who earned their bread and butter via stock images? As far as unknown locations – that’s a double-edged sword. In many cases sensitive places simply can’t sustain high traffic. On the other hand, if they are unknown they are in danger of being sacrificed for various extractive interests with no one to protest. I’ll avoid the politics though and say that from an artistic, creative, and spiritual standpoints I strongly discourage copying other artists’ personal compositions and ideas. I consider it unethical to pass someone else’s image as your own, and by image I mean the concept and visual arrangement rather than the physical file or film. Just because it’s captured on your memory card doesn’t make it your image. The vision belongs to the artist who conceived it. When I read it my friend he responded in German which can be roughly translated as – He was Antoine de Saint-Exupéry and interpreted as ‘You are either born or not as an artist‘. Your take? I disagree with the interpretation. My view is more in line with the Confucian principles of Great Leaning — that every person has the inherent ability to become great. I have no doubt that much of a person’s future success and potential to realize their talent is dictated by their upbringing and socioeconomic background but great art can be found everywhere and cuts across all cultures and tiers of society. In fact I think at the core of producing great art is the belief in one’s self. I wrote about it in the Third Bullet of my article Six Silver Bullets. What I believe Antoine de Saint-Exupéry meant was that people become set in their ways after the formative childhood period and it becomes harder and harder to adopt new perspectives and ideas as you get older. I think one of the most important exercises a person can go through at any point in their adult life is to take some time to tear down everything they believe in and that shapes their world views and question and re-examine it as objectively as they can. It takes a lot of courage to realize and admit it when your core beliefs (politics, religion, etc.) no longer align with your perception of reality and to be willing to rethink your life and be honest with yourself. I had to do it, and it was a painful experience but looking back I have no doubt I’m a better person for it. Who is your hero when it comes to photography and why? Any upcoming talent that you are really become fond of? There really are too many heroes to list. To me a hero is not just someone that makes great images but also a great role model in general. In that sense people like Ansel Adams, Galen Rowell, Eliot Porter and others transcend the simple distinction of “great photographers”. They were also great thinkers and activists. Same for upcoming talents. If you spend any amount of time on photography forums you will quickly recognize some incredible photographers, some of whom I’m also proud to have as personal friends. The ones I consider great are those that not only create beautiful work but are also passionate about their subject matter and work to promote their beliefs. I’ll stop short of naming individuals because I’m sure to miss someone. You recently published two books. How was the experience of working with fellow photographers? and tell us more about your new book ‘Exposures’. Working with the Mountain Trail team was a wonderful experience. Everyone brings to the table incredible talent and skill and we were able to put together a book with a richness and diversity of content that a single author simply couldn’t have. I hope we have more such projects in the future. “Exposures” was more of an experiment. I used a print-on-demand service for it because honestly I didn’t know what kind of interest it would generate. To my surprise I sold quite a few copies, despite the high cost of print-on-demand publishing, and responses have been very favorable. It falls into the category I call “vanity books”. It’s really about what I’d like to say and hope people will care enough to be interested. I was very encouraged by the experience and plan to publish a few more similar titles. Guy, I would like to thank you very much for your time and wish you all the best. It is my pleasure. I appreciate the opportunity to share my view and my images! 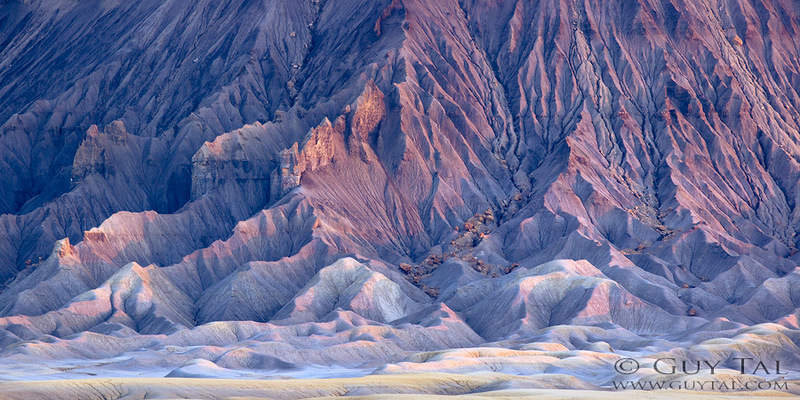 All the images are copyrighted work of Guy Tal.